Once upon a time, in the not-so-distant past, Verizon was still in phase one of its LTE lineup, which consisted of nothing but 4.3-inch slate phones with questionable battery life and very little to stand out from the rest of the competition. Now that we're seeing the second generation of devices coming into the 4G fold, Big Red appears to be pushing choice -- not just in terms of size and feel, but price as well. The Pantech Breakout was the first to, well, break out of the mold, offering a smaller form factor for a much more reasonable cost. It was nothing to write home about, but the fact that it existed gave us hope that we'd see a slew of phones in the same price range, finally making high-speed connectivity a more affordable option. 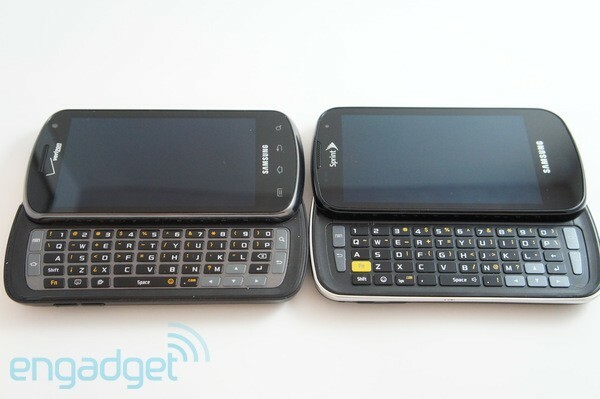 Shortly afterward, the Samsung Stratosphere sneaked up and snatched the spotlight away from Pantech, offering the very first QWERTY keyboard on an LTE-capable device for a cost similar to that of the Breakout. But when we first saw the phone, something felt eerily familiar: it looked almost exactly like the Epic 4G, a Galaxy S-era device that was released on Sprint's WiMAX lineup nearly a year and a half ago. Looks are one thing, but what about the internals? Does the brand new Stratosphere perform like an old phone, or does it give a completely fresh perspective on a 2010 classic? Read on for the full scoop. The Stratosphere is a decent budget device in Verizon's LTE lineup, as well as the only full QWERTY, but you'll have to live with aging components. How would you rate the Stratosphere? The Epic 4G got a lot of praise when it first came out... in August 2010. Almost a year and a half later, it's still a decent phone, especially now that it's finally been updated to Android 2.3. 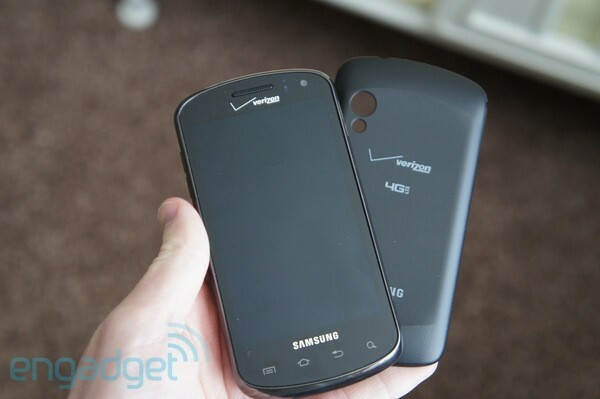 Still, its chassis isn't exactly what we'd expect to see in Verizon's premier LTE lineup in late 2011. And yet, here comes the Samsung Stratosphere, a phone with eerily similar guts and looks to Sprint's version of the Galaxy S (with the obvious exception of high-speed radios, of course). The Stratosphere uses the same display, 1GHz single-core Hummingbird Cortex A8 CPU with 512MB of RAM and five megapixel rear camera with LED flash and front-facing cam. At 4.96 x 2.54 x 0.55 inches (126 x 65 x 14mm) and 5.8 ounces (164.4g), it's a tad longer, a hair thinner and about 0.3 ounces heavier than the Epic 4G. The in-hand experience is almost exactly the same, as the extra heft doesn't make a substantial difference. 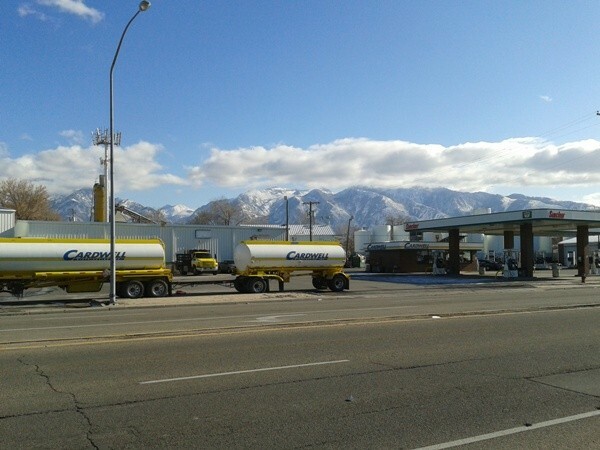 All in all, we're not looking at identical twins here, but it's easy to see the family resemblance. Verizon and Samsung have made a few tweaks to the keyboard and buttons, and it feels more solid and durable than the Epic -- we're not sure whether or not that's simply a perceived notion, but it helps put our mind at ease. On the front you'll find the same 4-inch WVGA Super AMOLED (read: PenTile) screen, a display technology that we highly praised last year because of its beautiful color saturation and contrast, but is now well behind the 720p HD display found on high-end devices like the Samsung Galaxy Nexus, HTC Rezound and LG Nitro HD. Granted, first-time smartphone buyers likely won't care as much about lower pixel density because of the bright and saturated colors, but it was difficult for us to go back to a low resolution after reviewing a string of newer devices. The fact that the Stratosphere is using a display that was considered top-of-the line a year and a half ago is a tough pill to swallow, given that it's a brand new phone. Yes, it's an LTE device, but it should have made room for some fresher components as well. The Super AMOLED screen we praised last year is now well behind the 720p HD displays found on higher-end devices. Also on the front is the same set of four capacitive navigation buttons. Above the screen sits a 1.3MP front-facing cam, a decent improvement over the Epic's VGA. Continuing our tour of the phone's exterior, you'll see tiny nuances in design when compared to the Epic 4G: the Stratosphere is completely missing a hardware shutter button, the front speaker has moved down a few millimeters, the screen lock / power button is longer, the four capacitive buttons are actually visible when not being used (a welcome change), the volume rocker has a slightly varied design and the micro-USB charging port is located at the bottom of the device rather than the top. The battery cover of the Stratosphere has ridges on both ends of the device, which offers a little extra grip when you're using the slide-out keyboard. It's also lightly textured, which adds just a smidge more friction than the Epic 4G's smooth plastic finish. Fortunately, much like its WiMAX counterpart, smudges and fingerprints aren't easily noticeable. The battery should get you through a full day on moderate use and still have plenty of juice left over. Pulling off the cover reveals an LTE-capable microSIM card, a microSD slot with a 4GB card included (though you can fit up to 32GB if you prefer) and a 1,800mAh battery, much good deal more substantial than the Epic 4G's 1,500mAh juicepack. Overall, we were highly impressed with the Stratosphere's battery life: it easily lasted a full ten hours on our video rundown test and we found that the phone could get through a full day and a half on moderate usage (consisting of emailing, social networking, taking pictures and videos and the occasional call). Our tests were conducted using 3G, so battery life when using LTE will certainly be reduced. Still, unless you're using the mobile hotspot, we'd expect you to be able to get a good full day of use with "4G" turned on. Speaking of high-speed connectivity, the Stratosphere gives you the native ability to turn off LTE and rely solely on CDMA. Go into settings, choose Wireless & Networks, scroll all the way to the bottom to find Mobile networks and choose "system selection." We feel this deserves mentioning since a large number of LTE phones on Verizon and AT&T alike neglect this feature, giving third-party developers the need to come up with a toggle switch of their own. It's more difficult to slide open the Stratosphere's keyboard, but it feels less likely to fall apart than the fast-springing Epic slider; we're not sure if that's a false sense of comfort or if it really is a more solid mechanism. When we first began using the phone, it almost took a little too much effort to get the keyboard to open with two hands, and was a nearly impossible feat to accomplish one-handed. Not surprisingly, the slider softened with enough use, but was still rather stiff. The keyboard isn't comfortable to use for long periods of time. The keyboard itself was less comfortable to use for long periods of time. It utilizes a five-row pad with a dedicated row of numbers, which we feel is a must-have for long-term typing. In direct comparison, the Stratosphere's keys were wider and shorter than the Epic 4G; as a result, the main board was a tad wider. 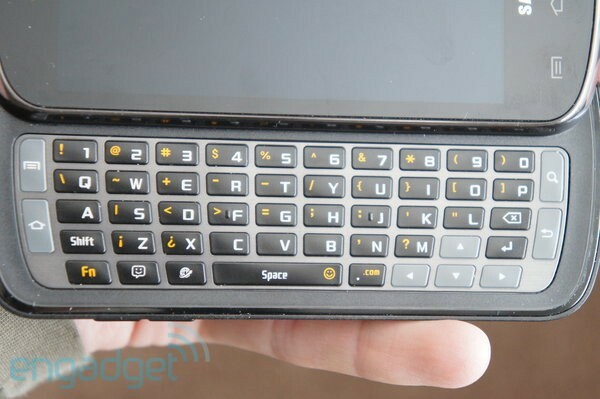 While the Epic's keys were flat and offered just the right amount of bounce, the Stratosphere opted for rounded ones that provide an additional amount of give -- this will ultimately be a matter of personal preference, of course, but our hands felt better using Sprint's iteration. The performance we got out of the Stratosphere was exactly what we'd expect from a device with Galaxy S-class specs, thanks to its 1GHz single-core Hummingbird CPU. Before we venture into benchmark scores, the touchscreen was very responsive, and in real-life use we only experienced the occasional lag; even in those cases, however, it was minimal and didn't add much frustration. Power users who absolutely need the speediest and most powerful phones won't want to bother with the Stratosphere, of course, but everyone else will be plenty satisfied. So how does it measure up in the cold hard numbers? Mind-blowing? Not at all. Bearable? Of course. Let's put it this way: the Stratosphere performed better than its older LTE brother, the Samsung Droid Charge, in every benchmark we ran. 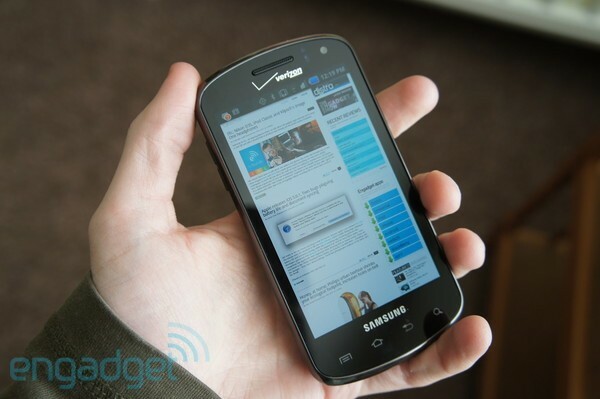 It also fared pretty much the same as the Android 2.3-powered Epic 4G. Our only concern here was the fact that the Pantech Breakout, Verizon's other budget-friendly LTE phone, did far better in a few tests (such as SunSpider and Linpack) and worse in others (Nenamark and Quadrant, for instance). Taking calls -- they're still technically called "phones," after all -- wasn't a problem, as we never had to repeat ourselves to the people on the other end of the line and didn't have any trouble hearing them. The speaker may not be the loudest we've ever heard, but it was sufficient. The same can be said about the loudspeakers for calling and listening to media. As some of you may recall, lackluster GPS performance was a huge concern with quite a few Galaxy S-class devices, so we wanted to check up on the Stratosphere's signal to see if we could give it a clean bill of health. In nearly every circumstance, the phone was able to hunt down our location -- accurate to ten meters -- within fifteen seconds. We even found success holding the device near a window in our basement without the assistance of WiFi. We're not going to fret too much about this camera. It's a 5MP offering from Samsung, which already has a reputation for using optics with better quality than most other OEMs. As such, we had high expectations for the Stratosphere's camera and weren't disappointed. It uses continual autofocus and takes advantage of touch-to-focus if you want to hone in on something besides the center of your image. The usual suite of Samsung settings are present here, such as macro and infinity focus, ISO (up to 400), metering options, blink detection, panorama along with other shooting modes, and the ability to adjust contrast, exposure, sharpness and saturation. There's also an LED flash. We came away impressed with the camera's low-light performance. Granted, it didn't offer the best white balance in direct sunlight and we weren't sold on the phone's macro focus, but pictures looked good otherwise. In fact, we were pleasantly surprised by its low-light performance when it was set to "night mode." In this mode the shutter stays open longer, allowing ample time to collect as much light as possible. We came away impressed by how much backlight the camera was able to pick up; be mindful, of course, that taking advantage of the open shutter will naturally require an amazingly steady hand to prevent blurry images. While we were satisfied with the still camera performance, we couldn't help but feel a little baffled by Sammy's decision to limit video resolution to 480p. We would've expected more from a mid-range LTE device launched in late 2011 -- especially when the Epic 4G offered a max resolution of 720p. Perhaps the OEM took our words from that review to heart, in which we mentioned that its "HD" quality was a complete fallacy and should be capped at 480p. Kudos to Samsung for taking feedback if that's what really happened, but in the space of 15 months we were hoping to see an improvement in the 720p quality rather than a demotion in specs altogether. With that said, anyone who could care less about having HD video resolution will likely be completely satisfied with the Stratosphere's performance, as it delivered smooth and crisp clips when capturing a good deal of motion. Accompanying Android 2.3.5 is Samsung's signature TouchWiz UI, though Sammy doesn't come right out and mention a specific version number; in reality, it looks incredibly similar to 3.0 (it even offers the same puzzle-piece home screen found on 3.0 devices) but offers a couple notable changes. The Stratosphere offers only five main panels on the home screen instead of seven, but also improves the app tray experience by adding in the same ability to add folders as we've seen on the Galaxy S II series and TouchWiz 4.0. If you're wondering why this is such a big deal, consider the explosive amount of uninstallable bloatware Verizon tacks onto its phones; without the option to tuck them away into folders, your menu is forever littered with apps you'll most likely never use. TouchWiz on the Stratosphere isn't as cartoony or boxy as previous versions. The Stratosphere even offers the ability to snap native screenshots directly on the phone. This feature was baked into TouchWiz 4.0 phones such as the Galaxy S II, so we were glad to see it show up here as well. To take advantage of the capability, all you need to do is press home and the power button simultaneously, and the image gets saved in a new folder within your photo gallery. Also improved in the Stratosphere's flavor of TouchWiz is its overall look. More specifically, it doesn't offer the same ultra-cartoony and boxy icons that you'd see on most Galaxy S-class devices. Aside from this, anyone who's used a TouchWiz device before will have no problem becoming acquainted with the Stratosphere's interface. We briefly mentioned bloatware, but let's dive in. Of the four major carriers in the US, Verizon seems to be the worst offender at most pre-installed apps onto its phones, and we found well over 20 loaded on the Stratosphere. As we were expecting, none of them appeared to be uninstallable, which simply means you'll have several apps taking up valuable storage space. If you rely on Google Talk for video calling, you'll need to look for a different phone or find an alternative app. Even though the feature was introduced in Android 2.3.4, it's up to the OEM and carrier to decide whether or not to implement it on each individual phone -- and the Stratosphere didn't make the cut. Lastly, we did a routine check to see if CarrierIQ is loaded on the phone, and are happy to report that it's nowhere to be found on the Stratosphere. There were few surprises in our assessment of the Stratosphere, if any. It's meant to be a budget offering on Verizon's LTE lineup, and certainly includes specs indicative of that fact. However, we still couldn't shake the idea that this is little more than an LTE-enhanced version of a device from the Galaxy S era, with just a few minor improvements in UI and performance. It's still a good phone, but it's more or less a rehash of a handset that's already 15 months old. That said, it remains the sole LTE device on Big Red's network that offers a physical QWERTY -- at least, until the Motorola Droid 4 becomes official -- and even when it gets some company, it'll likely continue to be a decent choice for anyone who doesn't need a phone with pizazz.